Adrian Clarke looks at tactical battles set to take place in Matchweek 10. To topple Manchester City will require a display of courage and energy by Tottenham Hotspur on Monday night. Mauricio Pochettino’s side have won 21 points from nine matches, their best start to a Premier League season. But on recent occasions their play has lacked intensity. Since their 3-0 victory at Manchester United, in a performance full of aggression and vitality, Spurs have played at a more subdued tempo. While running stats should not always be used as a gauge, the decline in Spurs’ average distance covered per 90 minutes has been significant. To compete with a City side outstanding on and off the ball, they must rediscover the athleticism they showed when covering more than a collective 119 kilometres at Old Trafford. Across the last six matches Spurs have run a collective 9km fewer per match. This drop-off has affected how Spurs regain possession. Pressing with less intensity than last term, Spurs have won the ball back inside the final third less often. Dropping from third in the PL rankings in 2017/18 to 13th this season, they have set up a deeper midfield block. This tactic has proven successful to a degree. Spurs turn the ball over the second-highest number of times in the middle third, behind only Liverpool. However, a marginally bolder approach would be advised against City. In the UEFA Champions League at the Etihad Stadium, Lyon hunted in packs in advanced areas and forced key errors from Pep Guardiola’s players. Liverpool’s similar approach last season consistently rattled City, too. Spurs also have their own reference point and this should encourage them to try a more high-octane strategy on Monday night. In a 3-1 home defeat by City in April, Pochettino’s men improved dramatically in the second half by hustling and pressing in packs. Pinning the eventual champions back inside their own half, they prevented them from playing out from the back. It is a policy that comes with risks, but has proven to be the best way to hurt Guardiola’s side. 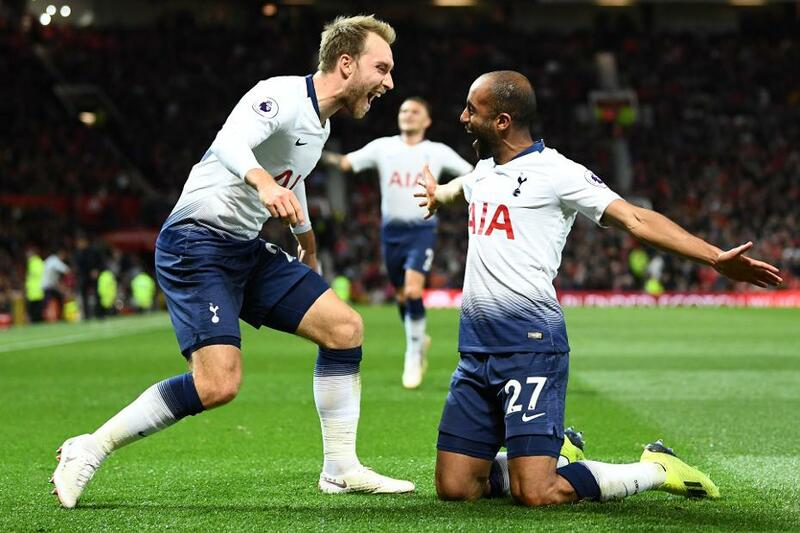 Christian Eriksen and Lucas Moura will have important roles to play. Outside of possession the pair are industrious, and their combined efforts will be crucial in Spurs’ attempts to unsettle City’s defenders. Closing down aggressively, but with intelligence, they must force mistakes and screen passes into Guardiola’s outstanding midfield. Preventing Fernandinho, David Silva and Kevin De Bruyne from receiving the ball in space is the key to negating City. And as the stats below show, these two forward-minded players are strong in this aspect of the game. From those transitions the influence of Eriksen and Lucas will also be of critical importance. On turnovers they have the pace and speed of thought to make things count. To breach a defence that has conceded only three goals across the opening nine matches, Eriksen and Lucas will be required to make the right decisions in those key moments. Inside the final third they are both potential match-winners. If they perform well, in and out of possession, Spurs' prospects of victory will be greatly enhanced.